Until now, I have only stayed in Te Anau during winter. 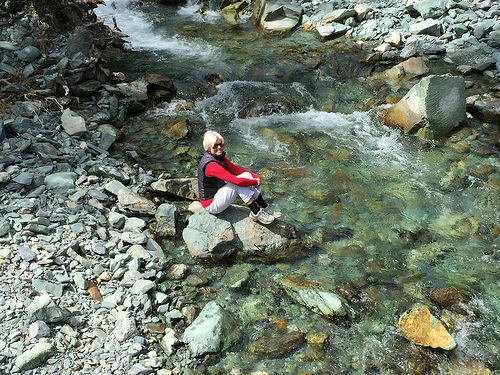 This time we’re here in the much warmer month of February and to enjoy Fiordland National Park. 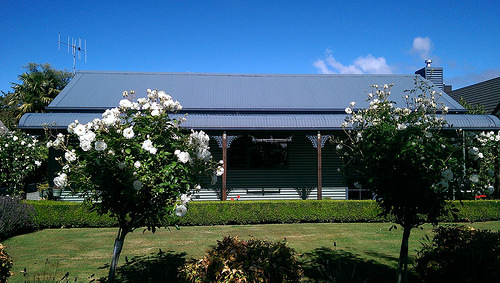 We’re based at the gorgeous Koa Toa Cottage, just a block from the main road. Nice and quiet! 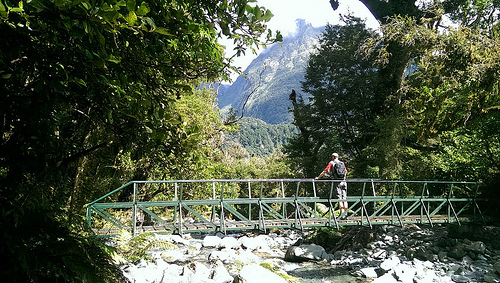 Its a perfect time for a day walk on the Hollyford Track. February is as peak summer month in New Zealand and its busy. We opted to drive 15kms off the main highway between Te Anau and Milford Sound into the Hollyford Valley. After passing the start of Lake Marian and Gunn’s camp, we arrived at the end of the Hollyford Road where the track begins. We only passed 3 people on the way – not bad in peak season! This work displays some beautiful features showcasing the pristine Fiordland area so popular with visitors. 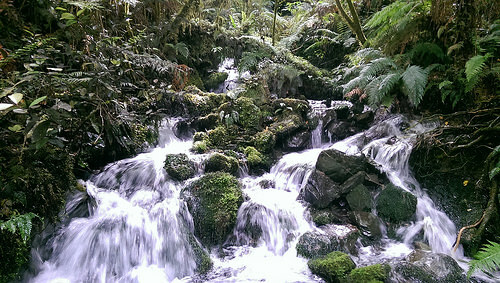 This is pure drinkable water that nature has thoughtfully refrigerated for Michael’s pleasure. The Fiordland Region holds a very special part in Michael’s heart. 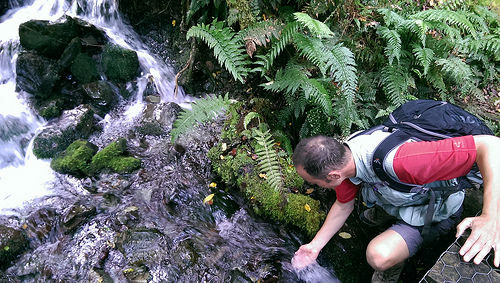 He’s done every walk down here, including the Milford Track, but prefers the Hollyford Track. 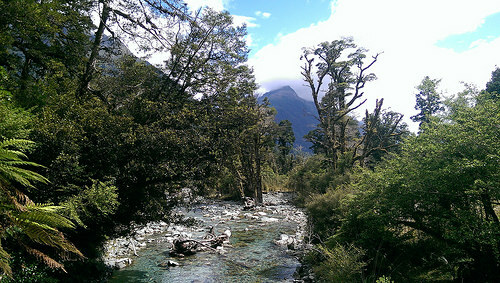 The Hollyford Track doesn’t get as much publicity as the Milford Track but it is just as beautiful. And you can have fun. There’s no great pleasure than making the swing bridge shake for your nervous wife! By far, the most stunning feature is the native bush and the variety of ferns. 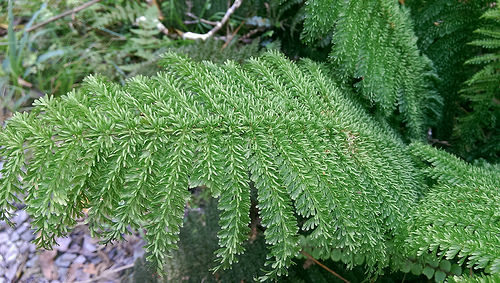 This Featherfern has an exquisite softness and it’s so beautiful to look at! 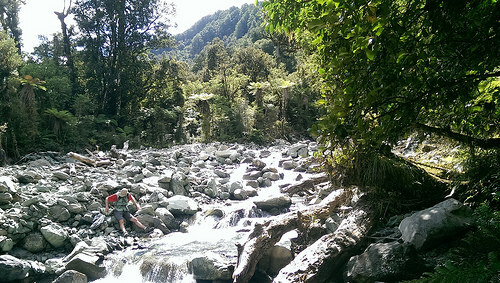 Walking the Hollyford Track is the perfect mind-cleanser. One of my favourite parts of NZ (besides the West Coast of course!) 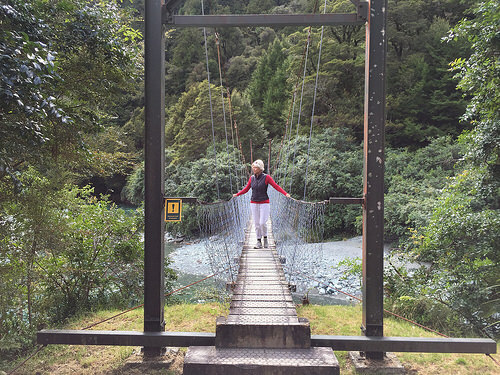 – love the Hollyford track, by far my favourite of the walks in that region. Martins Bay which is as far as many go, particularly on the guided walk is a very peaceful and magical place. So glad you got to enjoy some of it Pam. Between 8-9am each morning during the summer months, there’s this massive exodus of people leaving for Milford Sound and the town is very quiet during the day, until their return. Glad we chose to go in the opposite direction. It was a beautiful experience. Doing the Milford Sound by guided tour tomorrow.